Make the world a happier place by Smiling! Smiling - the purest expression of happiness - has the ability to regulate our blood pressure, strengthen our immune system, lower the risk of cancer, increase our life by seven years, and provide inner peace and satisfaction. The good news is that it doesn't cost a thing, yet unfortunately, an average adult smiles only 20 times a day. These happy face balls are irresistible and will squeeze a smile out of anybody. These 2" squeeze balls, some of the best stress balls in the world, are spongy and bouncy, and feature a wide smiley face. For ages 3+. 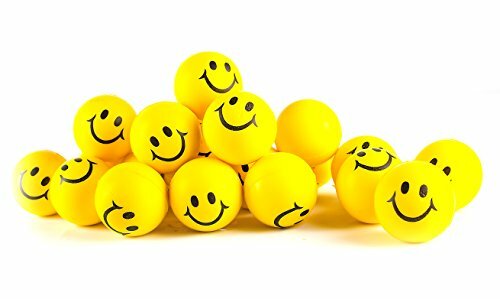 These happy faced smiley squishy stress balls make an amazing party favor, goody bag filler, Halloween trick or treat candy alternative, and Christmas stocking stuffer. BUY WITH CONFIDENCE! Backed by Neliblu 100% money back guarantee and manufacturer's warranty when purchased from an authorized reseller. 100% brand new and high quality toys. ADORABLE HAPPY SMILE FACE DESIGN WILL MAKE YOU SMILE, which will immediately improve your mood, because the simple action of thinking about a smile and the muscles you use when you do, triggers positive and happy chemicals in your brain. GREAT FOR STRESS RELIEF. Neliblu Stress relief squishies squeeze balls are proven to relieve stress as all of your energy and focus is being redirected and taken out on the stress ball. STRESS BALLS ARE A GREAT SELF REGULATION THERAPY TOOL that can help facilitate focusing and concentration! View More In Toy Balls.